Paris (AFP) – The ICC’s failure to try top Kenyan leaders for crimes against humanity in the country’s worst violence since independence spells “doom” for global efforts to fight impunity, former Kenyan leader Raila Odinga told AFP. Despite this setback, African countries must not quit the International Criminal Court as the continent is “the biggest violator currently of human rights”, the ex-prime minister said. War crimes judges dropped cases against Kenyan President Uhuru Kenyatta — the son of the country’s independence leader Jomo Kenyatta — at the end of 2014, and against deputy president William Ruto last week. More than 1,300 people died and some 600,000 others were left homeless after disputed elections in 2007 in Kenya’s worst wave of violence since independence from Britain in 1963. But the ICC said it was forced to declare the defendants had no case to answer because of a “relentless” campaign of witness intimidation as well as Nairobi’s refusal to cooperate, a charge that Kenya denies. “This decision spells doom for the international justice system and fight against impunity,” Odinga — who was declared the runner-up in the 2007 vote — said in an interview during a visit to Paris. “ICC allowed itself to be blackmailed by Kenya through the AU (African Union) that African states are going to pull out because you are trying African heads of state,” said Odinga, 71. Kenya has led a high-profile campaign against the ICC among African nations, accusing the tribunal of bias against the continent. Of the nine investigations the court has opened so far, eight are African — Kenya, Ivory Coast, Libya, Sudan, the Democratic Republic of Congo, the Central African Republic, Uganda, Mali and Georgia. The 2007 post-election violence in Kenya broke out after Odinga, who was then the opposition leader and a member of the Luo ethnic group accused then president Mwai Kibaki, a Kikuyu, of rigging his way to re-election. What began as political riots quickly turned into ethnic killings of the Kikuyu people, who in turn launched reprisal attacks. Odinga said that since the ICC dropped charges against Kenyatta and his co-accused, “it was good that Ruto was set free” as a matter of fairness between the opposing camps. Odinga said African countries’ abysmal rights record was all the more reason for them to remain in the ICC. “There is no alternative mechanism in Africa to deal with these cases and secondly Africa is the biggest violator currently of human rights,” he said. “Africa needs ICC more than any part of the world,” he said. The world must not view or treat Africa differently, he said, because the continent “is part and parcel of the international community and must be made to comply with the international standards as far as democracy is concerned. Son of Jaramogi Oginga Odinga, a prominent figure in the independence struggle and political foe of Jomo Kenyatta, Raila Odinga was jailed for eight years in the 1980s because of his fight for a multi-party democracy. “There are certain tenets of democracy which are universal, you cannot have double standards, that this is not good for Europe but for Africa it’s okay,” he said. 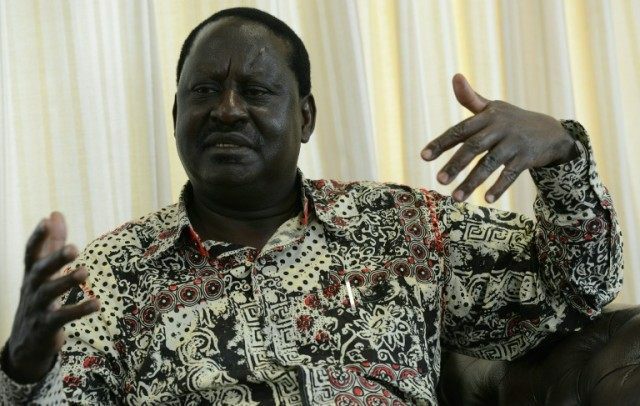 Odinga also rang alarm bells on veteran African rulers forcing constitutional amendments to extend their decades-old rule, often marked by rampant rights abuses and sweeping corruption and nepotism. Robert Mugabe, 92, has been in power in Zimbabwe since it gained independence from Britain in 1980 and shows no signs of stepping down, Teodoro Obiang Nguema has ruled oil-rich Equatorial Guinea with an iron fist for 36 years while Jose Eduardo dos Santos has steered Angola since 1979. “We are seeing the emergence of strongman presidencies and almost presidents for life where time limits of terms are being changed for presidents to remain for life,” he said. Despite “several changes (that) took place in the early 1990s (to) open up fixed-term limits… there are places where elections are almost just a formality,” said Odinga, who appears to be mulling a fourth bid for the presidency next year after losing to Kenyatta in 2013, a result he strongly disputed. Asked about detractors who say he is too old to make a third bid for the presidency, Odinga pointed to his “agemates” running for the Democratic nomination to stand for the US presidency, Bernie Sanders, 74, and Hillary Clinton, 68.